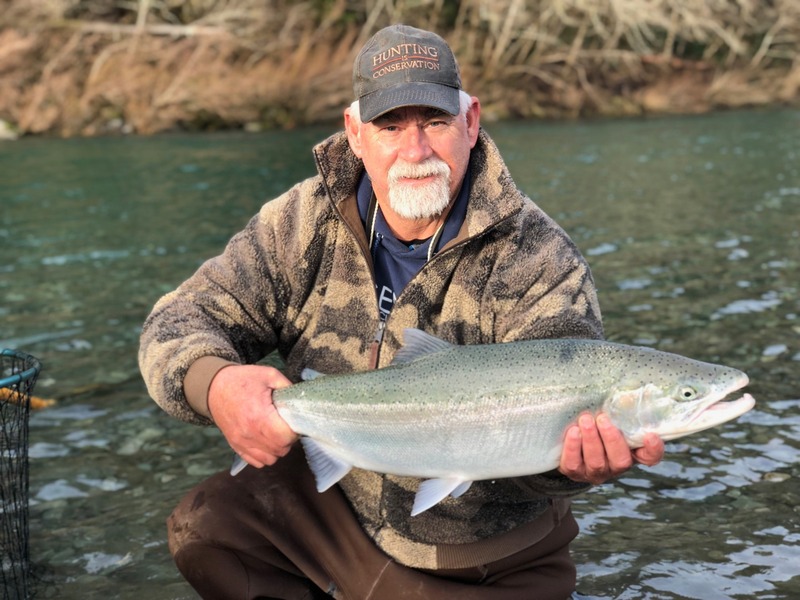 Alan Plumbridge of Sacramento landed a nice steelhead while drifting the Smith River on Wednesday. Rain is in the forecast for the weekend, which should improve fishing conditions on both the Smith and Chetco rivers. Photo courtesy of Mike Coopman’s Guide Service. Mother Nature can be so cruel at times. For the first time in nearly a month, the Mad, Van Duzen, and the South Fork of the Eel are all on the verge of turning emerald green. It’s the color that will make any winter steelhead angler giddy. But no sooner will they be in prime shape, rain will once again rear its ugly head. Storms, which are predicted to hit the area Friday afternoon, are forecasted to bring two to three inches of rain in the Mad and Eel river basins, wiping out our brief moment of bliss. If you’re looking to fish pristine waters, you best do so prior to the weekend. While the untimely rainfall will put an end to our green water, the Smith and Chetco will benefit greatly. Both are running low and clear, especially the Smith. If you’re looking for steelhead water this Super Bowl weekend, you’ll need to head north. “More rain is on the way, with the heaviest precipitation beginning on Friday afternoon,” said Kathleen Zontos of Eureka’s National Weather Service. “A series of storms will be pushing through with rain sticking around through Monday. For the period of Friday through Sunday, the Smith basin can expect from one and a half to two and a half inches of rain. The Mad basin can expect similar totals. The Eel basin could see a little more, with up to three inches falling. Showers are diminishing on Monday, and Tuesday and Wednesday are looking mostly dry. Another front is forecasted for Thursday and Friday, but the timing and amounts are a little uncertain at this point,” said Zontos. California Fish and Game Commission meeting will be held Feb. 6 at the Resources Building Auditorium, 1416 Ninth St., Sacramento at 8:30 a.m. Topics include potential listing of Northern California summer steelhead as well as the upper Klamath-Trinity river spring Chinook salmon. Issues regarding the Klamath River Basin sport fishing will also be discussed. The late comment deadline for this meeting is noon on February 1, 2019. Comments received by this deadline will be marked “late” and made available to Commissioners at the meeting. For more information, visit nrm.dfg.ca.gov/FileHandler.ashx?DocumentID=164452&inline. The meeting will be live streamed; visit www.fgc.ca.gov the day of the meeting. CDFW’s Annual Salmon Information meeting will be held February 27, at 10:00 a.m. to 4:00 p.m. at the Sonoma County Water Agency, 404 Aviation Blvd., Santa Rosa. The meeting will provide the latest information on California salmon stocks and the outlook for ocean salmon fisheries for the upcoming 2019 season. The public is encouraged to provide comments on potential fishing alternatives for California ocean salmon fisheries in 2019. A panel comprised of fishery managers, scientists and industry representatives will be assembled to address questions and collect public input that will be used in developing a range of season alternatives for California salmon fisheries at the March 5-12 Pacific Fishery Management Council meeting in Vancouver, WA. For more information, please contact Chenchen Shen at 707-576-2885 or Chenchen.Shen@wildlife.ca.gov. The lower Rogue is fishing very well, with guides anchoring and running MagLip plugs catching limits of steelhead according to Martin. “Big numbers of fish are moving up the river each day, and with perfect conditions, are willingly biting,” added Martin. The Smith is low and clear, and the fishing has gotten a little tougher reports Mike Coopman. “There’s definitely some nice fish around, we’re catching some in the teens. On average, we’re getting between three and five bites a day, and what you do with those is how your day will go. We do have some rain coming this weekend, so I’d expect the conditions and fishing to improve. We’ll also see a lot more pressure from boats fishing down south,” Coopman added. The Eel still has a lot of water, but the edges are starting to turn green. Unfortunately, the storm coming this weekend will put us back to square one. Flows are predicted at nearly 31,000 cfs by Sunday. The main Eel starts to fish well once it gets in the 3,500 cfs range. The South Fork dropped into fishable shape earlier this week, and there were quite a few boats working the area below Benbow. On Monday and Tuesday, boats were averaging two to three fish per day. Conditions should be excellent on Thursday and Friday before it blows out again on Saturday. Flowing at 640 cfs as of Wednesday afternoon, the Van Duzen has good color and is plenty fishable. Reports are hard to come by, but judging the angler effort, I’d say there’s a few fish being caught. Like the rest of the southern rivers, it’s forecasted to blow out late Friday. The river is in great shape, and quite a few fish are being caught reports Justin Kelly of RMI Outdoors. “The river has about two and a half feet of visibility as of Wednesday, and there’s fish spread throughout the river. The heaviest concentration of anglers is near the hatchery, where they’re mostly catching hatchery fish. Between the hatchery and the pumping station, there’s been more wild fish caught. Roe, soft beads and Spin-N-Glo’s have been the top producers. With more rain coming Friday, the Mad is predicted to blow out late Friday night.” Kelly added.